I’m sure you’re sick of seeing everyone’s Christmas home tours by now, but I promise mine will just be this one post. I put most of my Christmas decorations out the weekend after Thanksgiving, but I’ve been tweaking and adding things for the past week or so. Now that Christmas is only two weeks away, it’s time to stop messing around and just enjoy the decorations. As you might have noticed, I bought new stockings this year! For the past few years we’ve been using those cheap red and white furry stockings, so we were definitely due for an upgrade. I found these at Kirklands for $9.99/each. The glitter letters are from Wal-Mart and we’ve been using them for the past few years. I also reused the pine garland from last year’s mantle. My mom bought me that giant nutcracker a few years ago. I think some nutcrackers look pretty creepy, but I like that guy. He’s cool looking. The twig snowflake is from Big Lots. 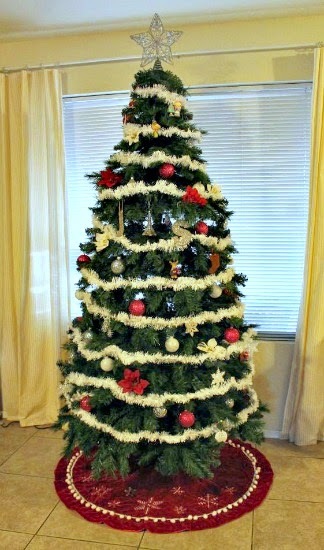 Our tree looks pretty similar to last year’s because I used the same garland and ornaments. Although, I did buy a few new ornaments during the after-Christmas sales last year and we bought this moose while we were in Alaska this summer. 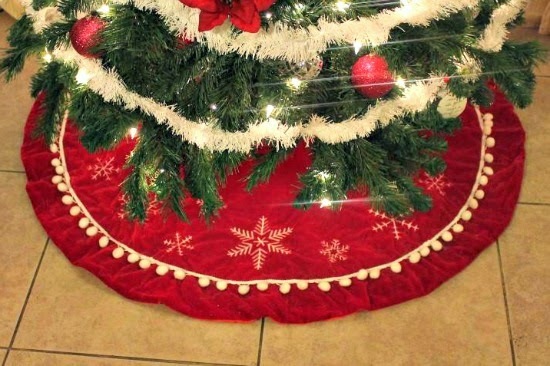 Oh, and I also have a tree skirt this year! I bought it at K-Mart after Christmas last year. I love it and surprisingly Ringo hasn’t chewed off any of the pompoms…yet…Please ignore all of the dog hair! Other than that I just put out my usual decorations. I do want to share my new favorite piece. 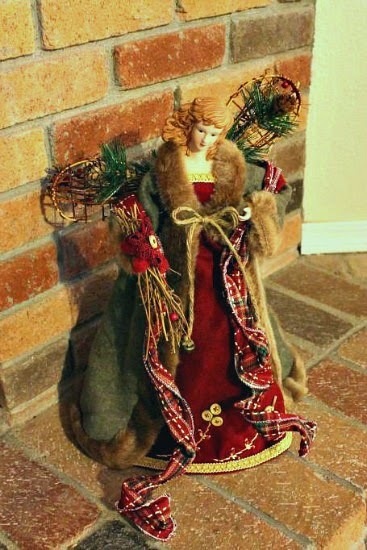 I bought this angel at Joann’s after Christmas last year for $8 (originally $40, I think). I think she’s so pretty and love how woodsy she looks. Now that the Christmas decorations are up, it’s time to finish shopping and start wrapping! 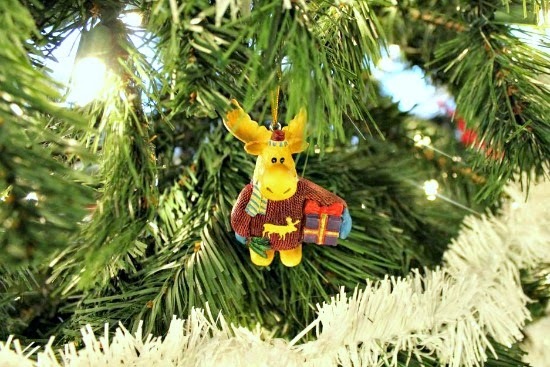 Love the moose in the cute Christmas sweater! 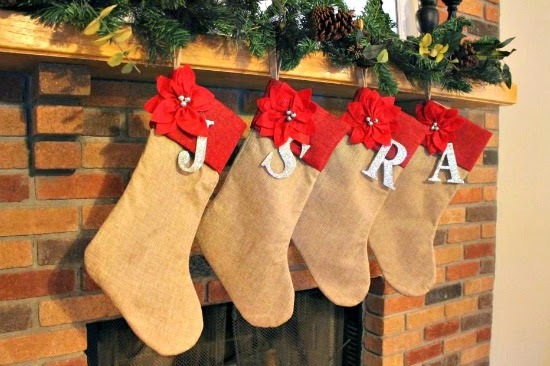 I love the stockings, especially the initial for each person/dog! Love all of your Christmas decorations! 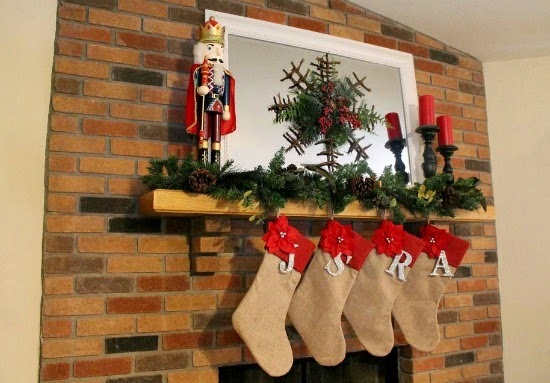 The mantle looks great and the new stockings are really cute.